What a couple of weeks! I don't know about everyone else, but I'm just about ready to curl up in a big (red) blankie and hibernate until Spring. After getting everyone outfitted for school, finishing up a huge project, driving my mother to, from and all over Indiana for a week, I need a nap. Before anyone, woman or animal, can hibernate, you need to stock up the old tummy reserves, right? Of course. There's no better way this time of year to do that than a good old fashioned roast, soup, stew or casserole and one of my personal favorite additions for flavor is College Inn Broth. Boxed or canned, it's just the right balance of flavor I'm looking for when I don't have time to make my own stocks or broths from scratch (which doesn't seem to be too often lately!). 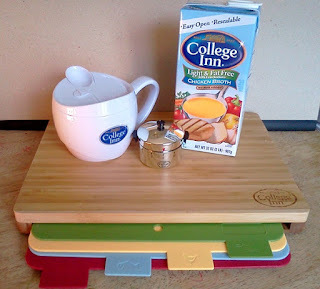 So, when I received some College Inn Broth goodies and recipes from Amanda Freitag for a dinner party, I got right on it. First, I made Amanda Freitag's Beer Braised Bold Beef Stew and Smashed Potatoes. Everyone loved it. Several of us ate it at home and it made enough for me to share at work, as well. The flavor and color was so rich and it went together easily. If you get the chance to make this, do it! Next, I made my mom and grandmother's chuck roast, which I've posted about before, but instead of the usual water added, I used College Inn Tender Beef Bold Stock. I can say there was not a shred of meat left on that platter at the end of the meal. For that recipe, go HERE. 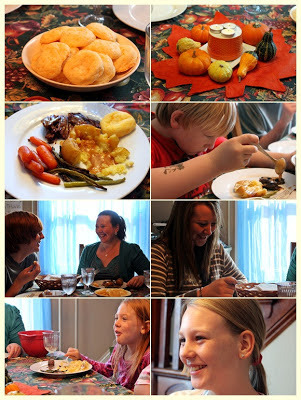 Our family chuck roast, even better. Fun times at the dinner table. Not sure what all the giggling was about, but it's all good. The Facebook contest is running until October 28th . The grand prize winner will win a $5,000 cash prize and a three day trip to San Francisco for two to attend a charity dinner with Amanda Freitag. (Who doesn't love Amanda Freitag?) Click HERE for the College Inn Facebook page and HERE for the contest app. For each eligible recipe entry, College Inn will donate $1.00 towards the Share Our Strength No Kid Hungry Campaign, up to $20,000! That. Is. Awesome. I've partnered with Share Our Strength for more than a few campaigns and this one is just another step toward ending childhood hunger. Good deal. Leave a comment and you will be instantly entered! Make sure to leave an email where you can be reached. Contest ends Monday, November 5th at 11:59 PM so enter today! **Disclaimer: All College Inn Product, branded products and gift card for ingredients was provided free of charge. All views are my own and not influenced in any way by College Inn. Do you believe that there's not enough emphasis on soup in contemporary culture? Have you ever wondered why nobody has ever written a rap about soup? Have you ever dreamed of being in a music video about soup? Here's a mugshot ... er, photo, of the rapper himself. John Inverness is an armchair philosopher. He does philosophise about other things, but it is mainly about armchairs. John loves soup. So much so, that he has written a rap about it, based on Snoop Dogg's "Drop It Like It's Hot". It's very funny, but he needs a bit of moolah to make a video. He needs your help. Head on over to watch this very silly video and drop a buck or two to help John reach his goal!